Walking Frame Basket Useful, clever and safe! If you’re a regular walking frame user, you might find this item of use to you – it’s a basket for zimmer frames. It really is ideal for carrying items safely, allowing the user to keep their hands free to move the walker. 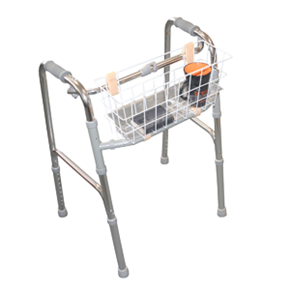 The walking frame basket attaches easily and safely to the walker frame using the hook and loop straps supplied, and even comes with its own plastic tray insert. Useful, clever and safe! As it happens, (a) because the items was in a jiffy bag it was a bit bent, but nothing I couldn\'t deal with and (b) there were not enough ties to attach it to the frame. However your people were very helpful when I phoned and the ties arrived by post next day. handy basket - just what I wanted - good service & delivery. Helpful staff at customer services. works fine. Wouldn't put in anything too heavy or Mum can't move the frame!